Let's start off on a topic completely unrelated to anything beauty, shall we? There are only two episodes of Sons of Anarchy left. So disappointing. Now, I never intended on watching the show, but got sucked into it, and now I'm afraid I just won't know what to do with myself without it. Okay, slight exaggeration, but it will be missed. Something that's not to be missed though (aren't my segues amazing?) 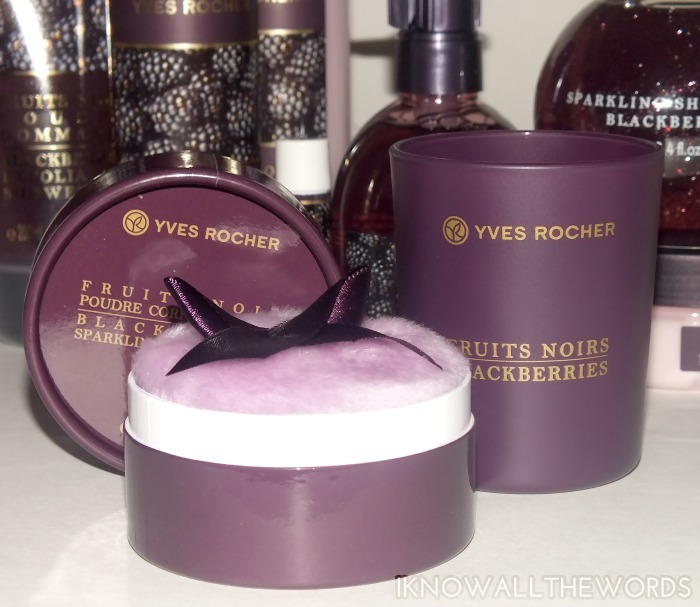 are the limited edition holiday scents from Yves Rocher. We've already seen Pear Caramel (here) so today is all about Blackberries! Read on for a look at the collection. 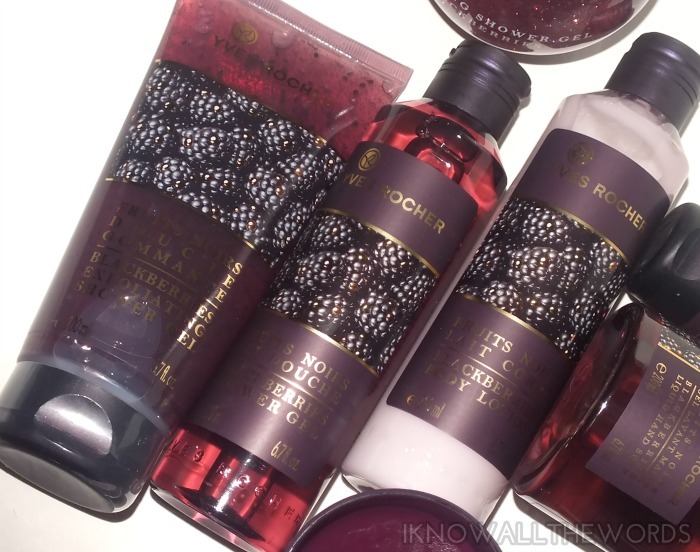 Much like the Pear Caramel scent, Blackberries is completely delectable (and almost edible) and one of the most realistic berry scents I think I've ever experienced. 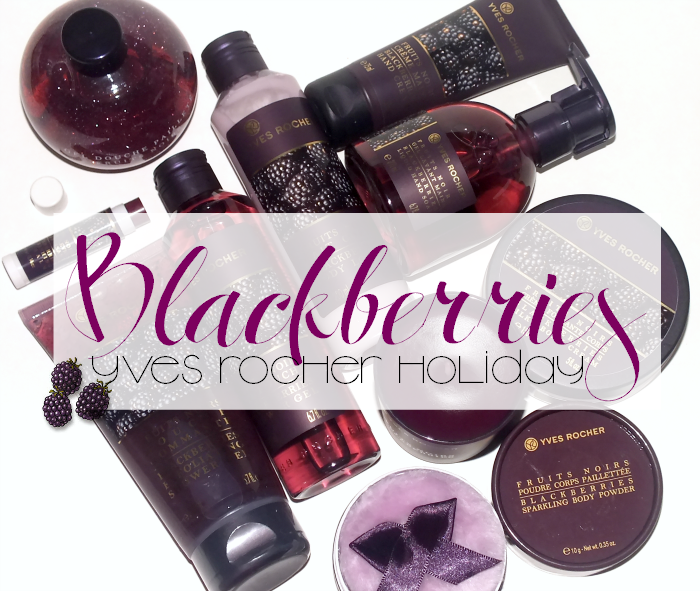 Yves Rocher has packed all of the goodness of the most perfect, sun-ripened blackberries in a whole host of products- basically anything you could ever need bath & body related. You've got your basics- Shower Gel and Body Lotion, the Silky Body Cream for a richer moisturizing experience, and a nice addition, the Exfoliating Shower Gel, which is enriched with cornflower water and has kiwi seeds to cleanse and gently exfoliate. Lazy girls unite! For something a little special- or a really cute gift- there's the Sparkling Shower Gel, which, as the name implies, sparkles thanks to the added glitter. Not to worry though, the glitter doesn't actually stick around on the body, but does make the bottle a little too much fun to stare at. Moving away from shower time, we come to hands. I have to admit I usually stock up on the YR hand soaps because they always smell so good. This year's offering is no exception. Pair the Liquid Hand Soap with the Hand Cream for a great little gift- especially great for your hostess! The hand cream has a great texture that isn't too heavy, absorbs cleanly and, do I have to say it again? Smells amazing. For lips, a little Nourishing Lip Balm, which leaves lips not only hydrated, but also with a sheer plum tint. And, for those with no interest in beauty items, or who also happen to love candles, the Scented Candle. 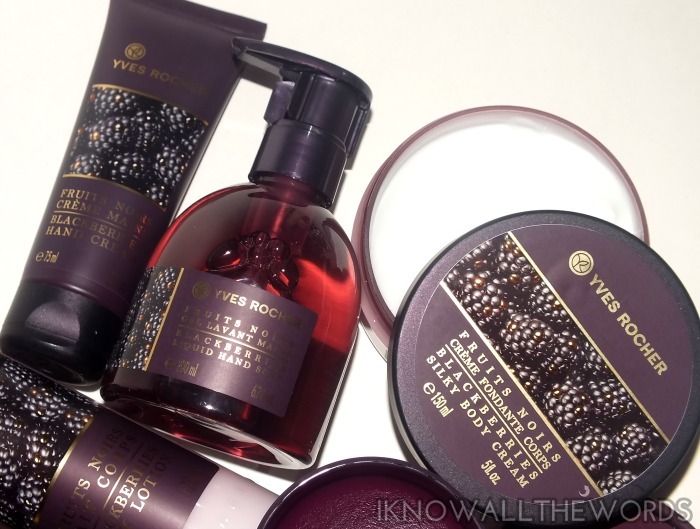 The candle offers up the same ripe blackberry scent that fills a medium size room nicely. I like that scent is noticeable but not cloying or overpowering and that the candles burn evenly. There is little worse than a candle that burns straight down the middle. 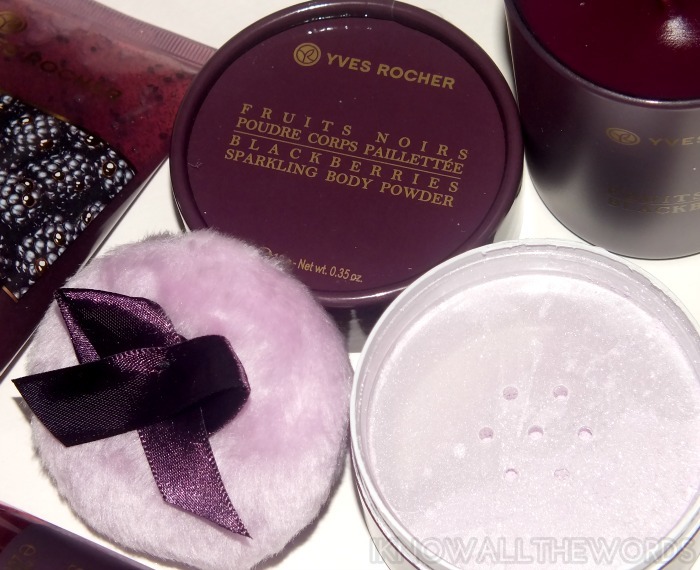 Last, but not least, the pièce de résistance the Sparkling Body Powder. What could be more fitting for the holidays than a dusting of silky, glowy body shimmer? 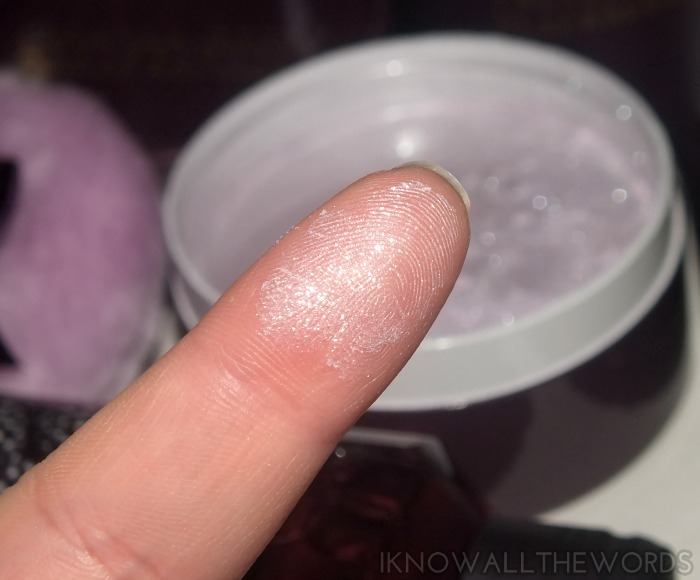 The powder is incredibly fine and leaves skin feeling ultimately smooth and finely veiled in both shimmer and blackberry scent. The powder comes with it's own little, purple, bow adorned, puff which is not only adorable, but the perfect way to apply the powder. Overall, this is a perfect selection of blackberry products. Should Blackberries and Pear Caramel not be your thing, the Cocoa Orange range from last year has returned, along with Red Berries. Indeed, something for everyone!What scent would you go for? Tried any of these products? Thoughts?